Greek staters and tetradrachms from the classical era are so varied and fascinating that they could easily become a lifetime pursuit. Coin technology had already spread from the workshops of Asia Minor to all parts of the Greek world by the end of the archaic period around 480 BC. 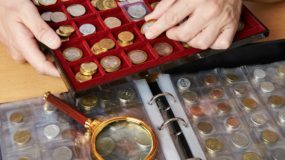 By then, individual tribes, kings and city-states were increasingly interested in creating high-value silver coinages to facilitate trade and promote their success. At the same time, rigid archaic coin styles were gradually transformed into nuanced, sculpted designs. 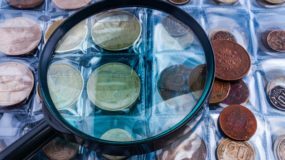 With the marked increase in participating mints and with generally little coordination among them (except for regional clusters of issuers adopting similar weight standards), a great variety of coin types and formats were introduced. In the midst of all this, the quasi-Carian city of Kaunos chose a winged goddess and a sacred stone for the obverse/reverse of its new stater coinage. Kaunos wasn’t a major center in the scheme of things, but it managed to parlay its chosen flying-goddess coinage into one of the more distinctive ‘Greek’ issues down to the present day. In our existing overly entitled society, we easily accept thatany normal, minimally talented human can fly anywhere in the world at a moment’s notice (while griping about the negligible cost). Ancient Kaunosians would have found the concept of regular human flight to be altogether too fantastic, but they would have agreed that the worship of a youthful, winged apparition in female form was entirely normal. Gods, heroes and myths were very real to these people, so they would have believed that this goddess actually existed and that she needed wings to fly. She was just as real to them as the coins that depicted her. Silver Kaunos staters have never been common. Because they are unusual and attractive, they are easy to recognize. 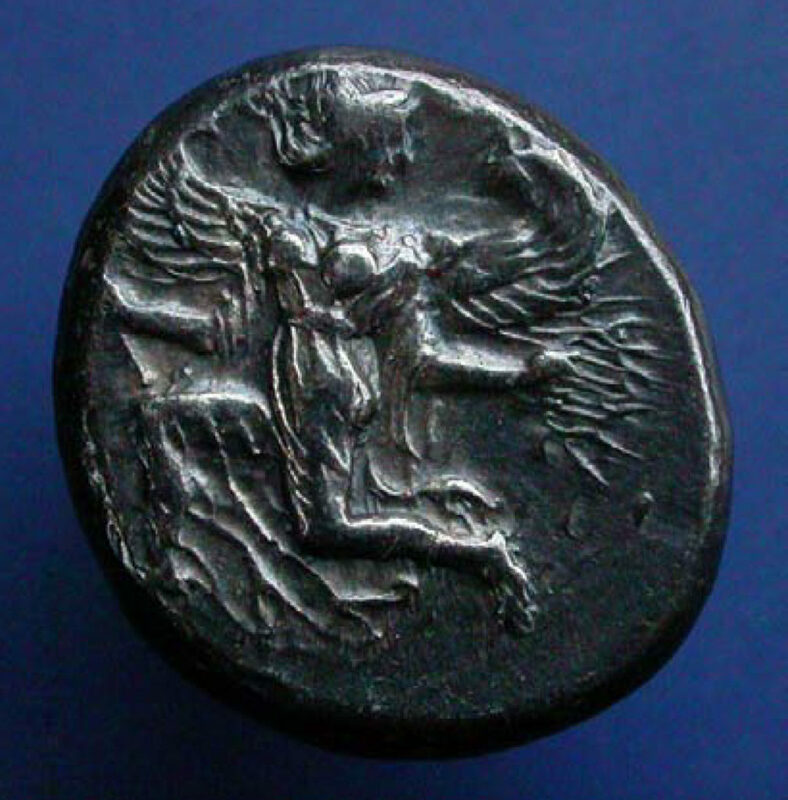 Very few mints employed a winged figure on their coins, other than Nike and a few bird species, but even then Nike was usually shown in a secondary role. Such was the situation in 2004, about five years after I started buying Greek coins when I saw my featured coin in a CNG electronic sale. It was estimated at $1,000US and noted as having been struck from worn dies, but weird flans and wear were normal for this mint. The first ones of the type, struck about 80 years earlier at the end of the archaic era, were irregular lumps with crude designs, and they were punched in a careless manner. My regularly shaped exam- ple was produced at the end of the series, but I knew that other staters with clearer images and imperfect strikes could sell for many thousands of dollars. With few specimens even offered at the time I bid, I won this one and even paid a bit under estimate (a kind of victory, pyrrhic or otherwise). Kaunos was a locally established coastal town in the ancient district of Caria in southwestern Asia Minor, near the current town of Dalyan (see map in Figure 1). I have discussed Caria before in a couple of articles about the subsequent, 4th century BC, Hekatomnid satraps – Hekatomnos, Maussollos, Pixodaros and the rest of the dy- nasty (The Planchet, January 2013 and March 2013). Those articles focused on the original Carian capital city of Mylasa and Maussollos’s new, fortified capital at Halikarnassos. 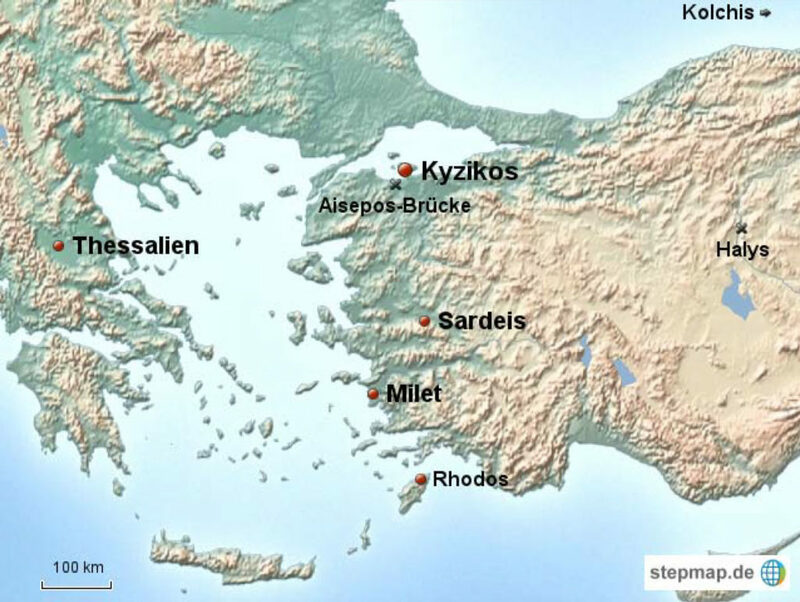 Kaunos was located on the opposite end of the Carian coast from Mylasa and Halikarnassos, near the border with Lycia; plus its alphabet, language and customs were different from those in Lycia and even the rest of Caria. Though Kaunos had been known from ancient times, the site was only rediscovered in 1842 by the English arche- ologist, Hoskyn. The following two-paragraph excerpt from my Maussollos article of January 2013 describes Persian interaction with Caria from the 7th century to Kaunos’s 5th century BC heyday. Kaunos’s period of greater indepen- dence and prosperity occurred between the time that Persia was defeated by the Greeks and the time that the Persio-Carian Hekatomnid satraps took control in the early 4th century. ‘In the 7th century BC, Caria was controlled by Lydia. Then in 546, it was annexed by the Persian Empire in its westward expansion. Because of the cultural and administrative diversity of the peoples incorporated into the Empire, satraps were appointed to ad- minister the regions. 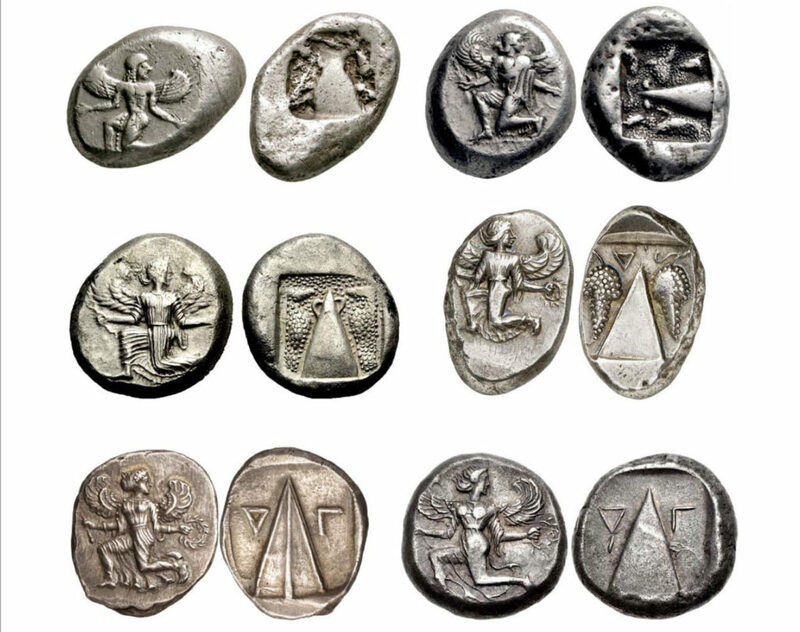 Satraps from these different regions (such as Pharnabazos, Datames and Mazaios) minted their own radically different coinages, although on a similar 10.3-10.7 gram weight standard. The satraps owed allegiance to the Persian King, but they also had a degree of autonomy. Figure 2 – Kaunosian style rock tombs are found in parts of Caria and Lycia. Rather than dig a simple niche in a cliff face, or carve a totally free-standing, pedestal rock enclosure (both of these types are otherwise also found in the area), these Kaunosian tombs were designed to impress with large interior enclosures not far from ground level, fronted by an imitative building facade incised into the cliff face. 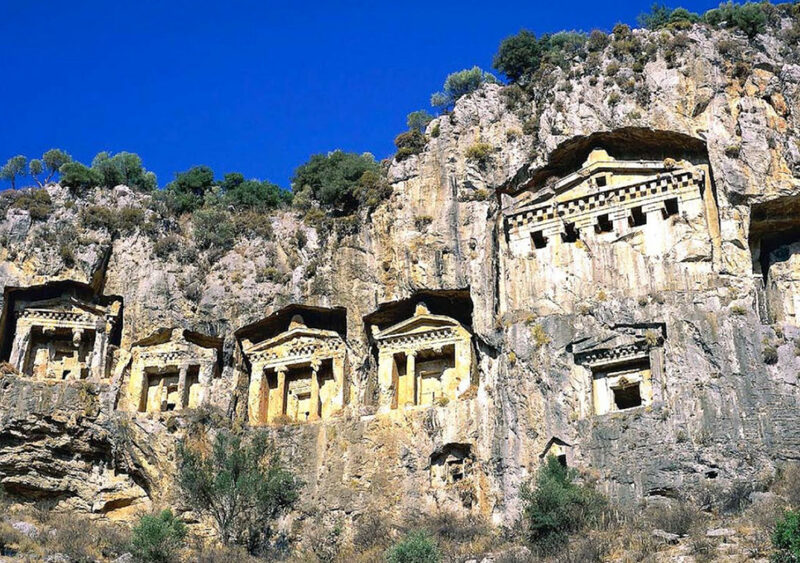 The tombs shown above are located at ancient Kaunos near Dalyan, Turkey. They are a famous tourist draw but in 1996 I saw a similar group on the edge of the lovely town of Fethiya and more at Pinara. Kaunos was the capital of its own semi-autonomous territory through the Persian era, and it was an important port. The original name of the city was Kbid (Ksibde in Lycian script), but it was changed in the 5th century to Kaunos as a result of Greek influences. The city’s domain extended along the mountainous coast south from the current Carian city of Mugla, across the entire width of Lycia to the Pamphylian city of Antalya. In its 5th century heyday, Kaunos paid tribute to the prevailing powers to retain its independence as a port city (it reportedly paid ten talents to the swaggering Athenians after the Persian defeat). The city was built on rocky terraces accommodating massive city walls, large religious structures, a theatre 75 meters wide seating 5,000 patrons, a wrestling school, a stoa, an agora etc. Its acropolis was built at the foot of Mt Tarbelos on a rock outcrop 152 meters above the sea. Satrap Maussollos had a role in enlarging, fortifying and Hellenizing the city in the mid-4th century, then it was over-run by Alexander the Great in 334 BC. It had two ports, one larger and one smaller, used for trade and the military. Merchant ships traversed the coast from the Aegean to the eastern Mediterranean dealing in salt, salted fish, slaves, pine resin and black mastic used in shipbuilding. Much of this trade collapsed starting in the 2nd century BC when the adjacent bay and river delta began silting up. The ancient site is now a few kilometers from open water. One significant feature of Kaunos was its rock cut tombs with architectural embellished entrances, dated to the 4th to 2nd century BC. The tombs consisted of a plain, room-sized chamber chiseled into a shear cliff-side, fronted by a large incised temple-style building decoration and rectangular door opening (see Figure 2). The faces of these tombs incorporated pillars, triangular pediments and toothed friezes, which makes them very impressive. I have visited a few examples of such tombs in the Kaunos region – one group in the cliff above Fethiya town and another near the mountainous site of Pinara. It’s likely that this elaborate type of tomb construction spread from Kaunos itself. Kaunos was a fairly wealthy and powerful city in its time. As was the fashion, the city instituted a local coinage proclaiming its two distinctive civic badges – a running, winged goddess on the obverse and a sacred, conical stone on the reverse (sometimes called a ‘baetyl’ in accordance with Phoenician practice). The goddess is now interpreted to be similar, or equivalent to the Greek goddess Iris, who travelled on rainbows and was a messenger to the Olympian gods. She was considered to be a link between heaven and earth, and she was married to Zephyros, god of the west wind. In her Carian interpretation, she is thought to have transported the souls of departed citizens to the afterlife. The sacred conical stone shown on Kaunos’s coins was originally located in one of the city’s temples. Many such sacred stones are thought to be meteorites that were worshipped as emissaries from the gods, but this one may have simply been revered as a symbol of the mythological king who founded the city. Kaunos issued its first coins circa 490 BC, as noted in Figure 3. 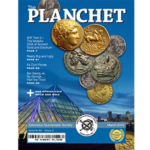 This was towards the end of the archaic era so we expect that the coin flans would be lumpy, the figures would be rigidly posed and the reverse punch would be small and crude. The Kaunos coins do not disappoint in this regard. It is a bit unusual to see, however, that the city’s splayed, archaically posed goddess figure was maintained through the entire 5th century. The figure’s role as a badge was obviously more important than her role as a living goddess. It was only at the end of the minting period where she was given a more specific female form and realistically flowing robes. Changes to the reverse were a bit more dramatic, though the sacred stone profile remained much the same. There was a progression of background image treatments within the incuse punch outline. The initial crude markings became more concise and speckled, as if they were intended to be cloud-like. The speckled forms then coalesced into two bird-like shapes flanking the stone, later becoming well- defined grape clusters. The first letter of the legend appeared at this point – an upside down Greek ‘D’. In the last phase, circa 400 BC, the speckled clusters disappeared and were replaced by a two-letter legend in Greco- Carian script – the same upside down ‘D’ plus the Greek ‘G’. These two letters were actually used in the Kaunosian alphabet to represent ‘K’ and ‘B’, the first two letters of ‘Kb d’, the original name of Kaunos.